Our range of products include horse play equipment. 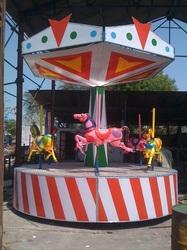 We are one of the celebrated manufacturers, suppliers and exporters of Horse Play Equipment. Widely known for its longer functional life, operational efficiency, flawless finish and smooth operations, the offered equipment is vastly demanded among our customers. Horse play equipment is easy to install and requires low maintenance. Our customers can avail this product at reasonable rates. Looking for Horse Play Equipment ?